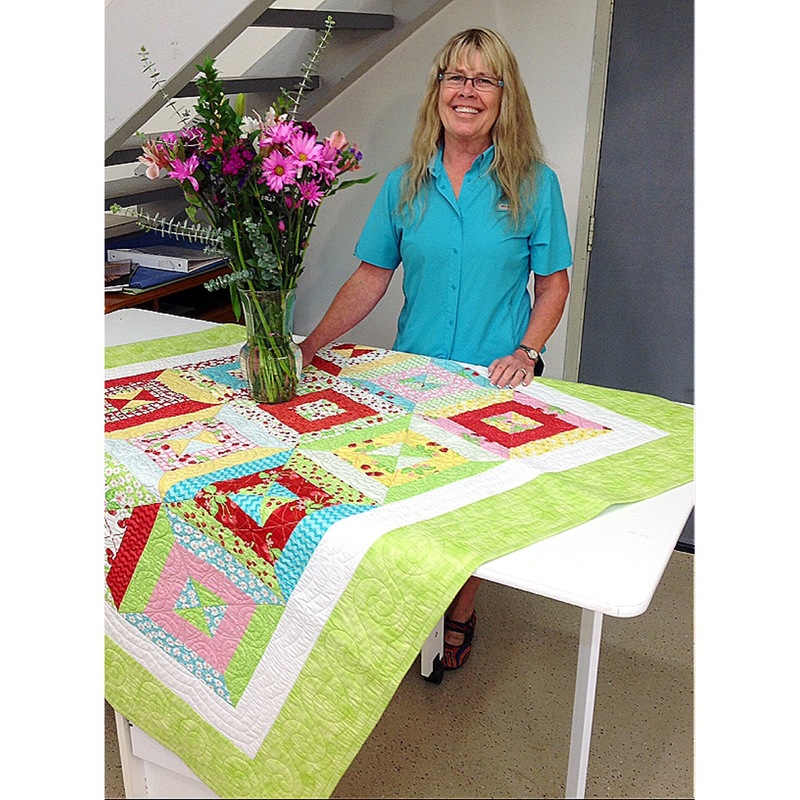 Nancy Zieman is hosting a “Quick Column Quilts Blog Tour” and has asked me to participate! 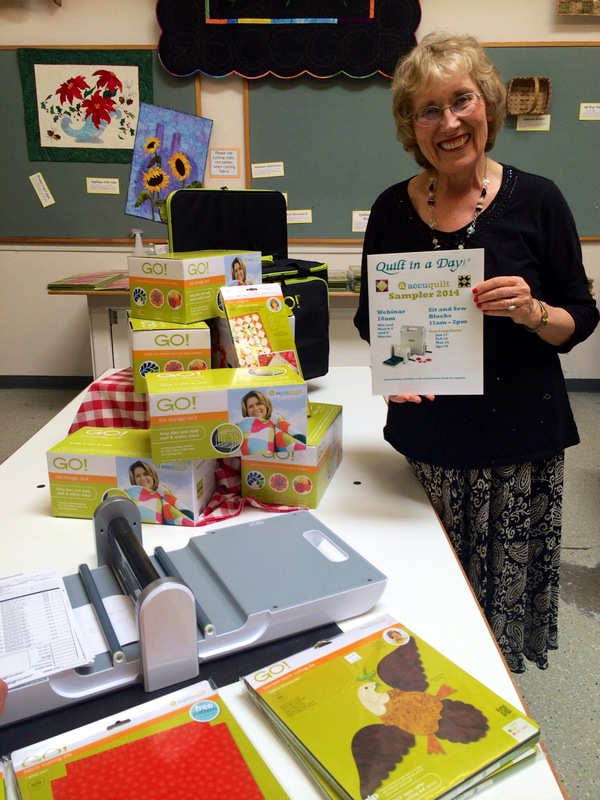 Thank you, Nancy, for thinking of me and Quilt in a day. You also nominated me for the ALS Ice Bucket Challenge, which Orion and I accepted and did for ALS and MS. You can view our video here. 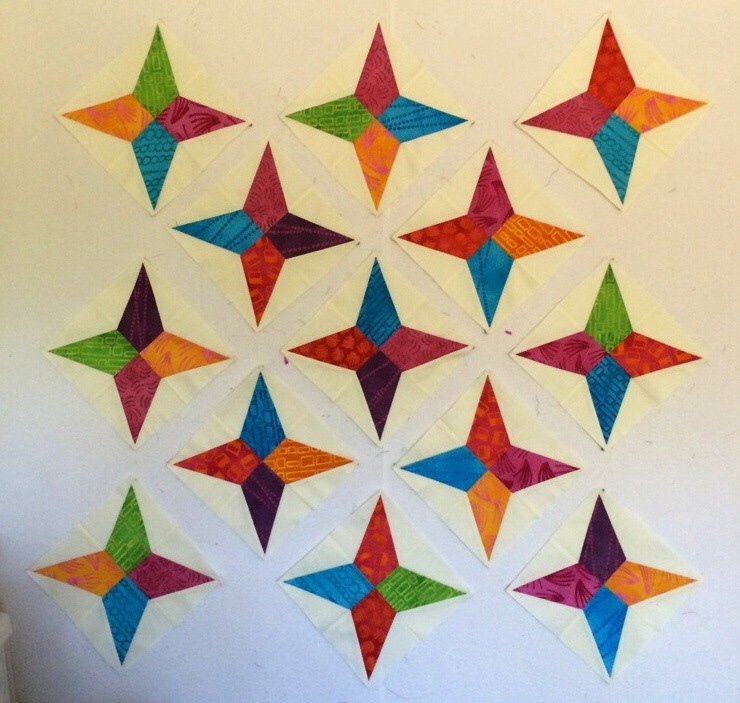 With my busy schedule, Sue has designed and sewed up the quilt for our Blog Post. You can read more about Nancy’s new book and the blog hop links on Nancy’s blog post here. 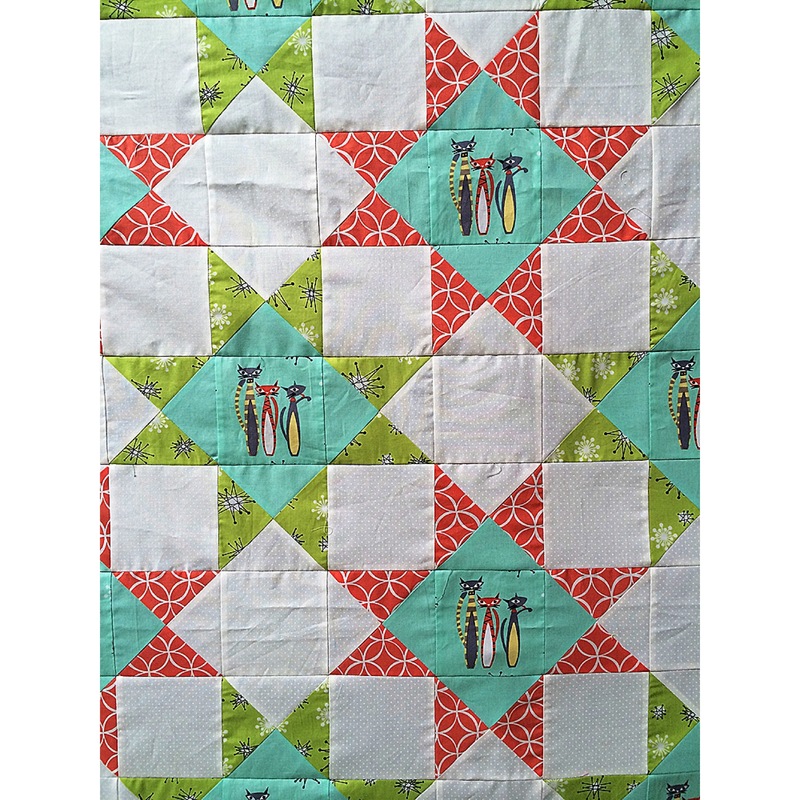 Enjoy the following quilt, made by Sue, in honor of Quick Column Quilts. 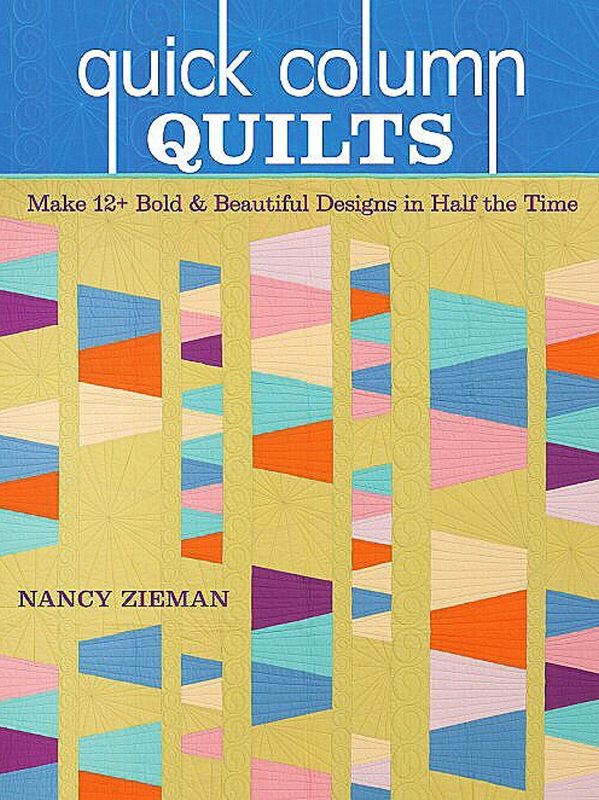 I received a pre-published copy of Nancy’s new book, Quick Column Quilts. I am excited to be asked to make a sample. 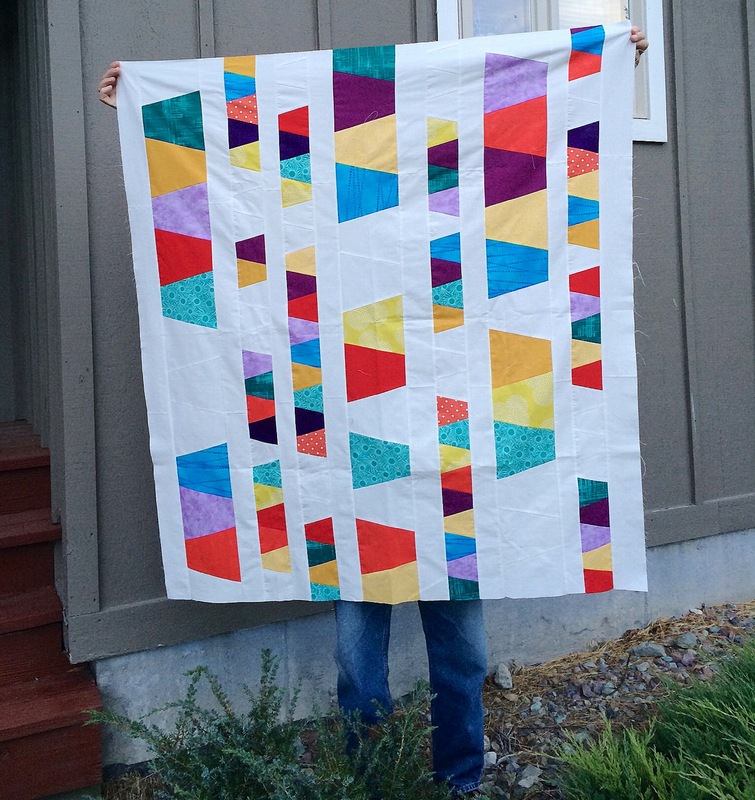 I love the tumbler dies from Accuquilt and decided to make a quilt like the one featured on the cover. I pulled out my two tumbler dies, the large 6 1/2″ Tumbler (55020) and the small 3 1/2″ Tumbler (55015). 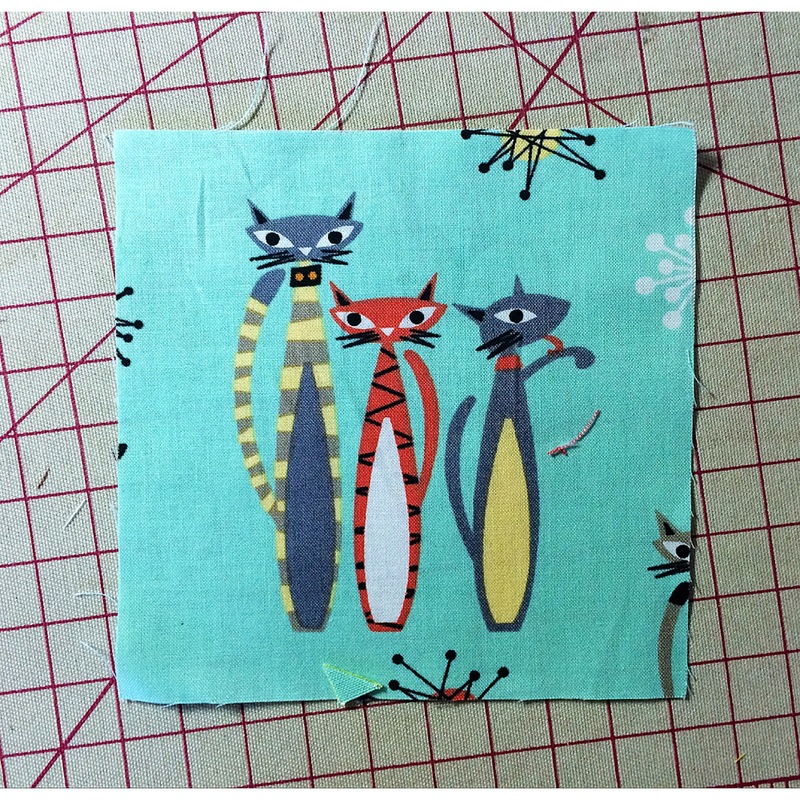 To get the best use of my fabrics for the large Tumbler, I layered four strips, cut 1/2″ wider than the die. 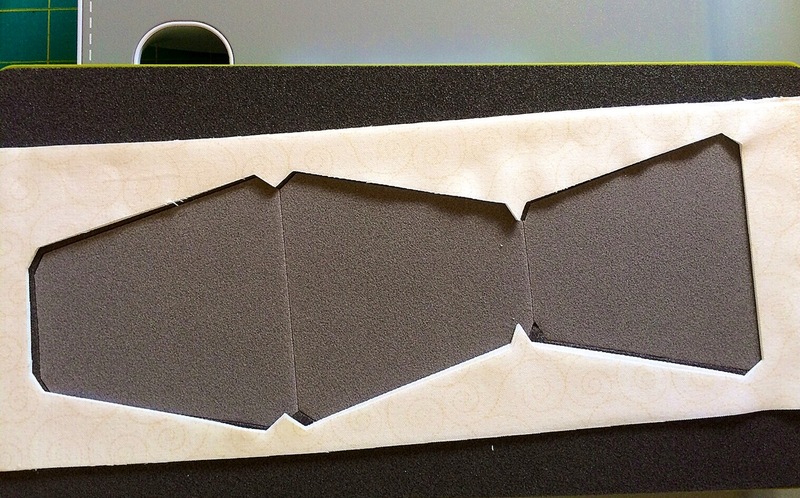 I made my first cut and then turned the fabric strip around so there is very little waste. The smaller die is designed to cut 3 Tumblers at a time. Both dies include the seam allowances. 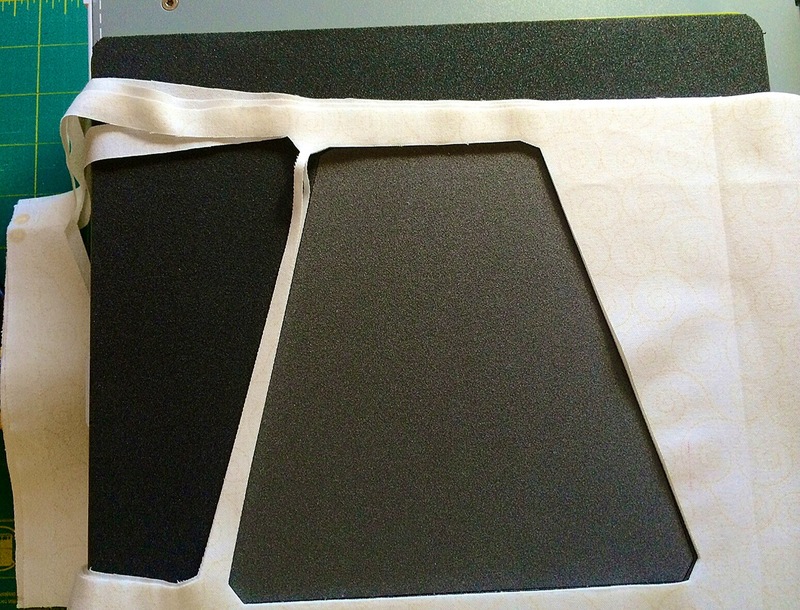 After cutting a variety tone on tone fabrics and a Background, I used a flannel board to lay them out. The quilt sewed together so easily. 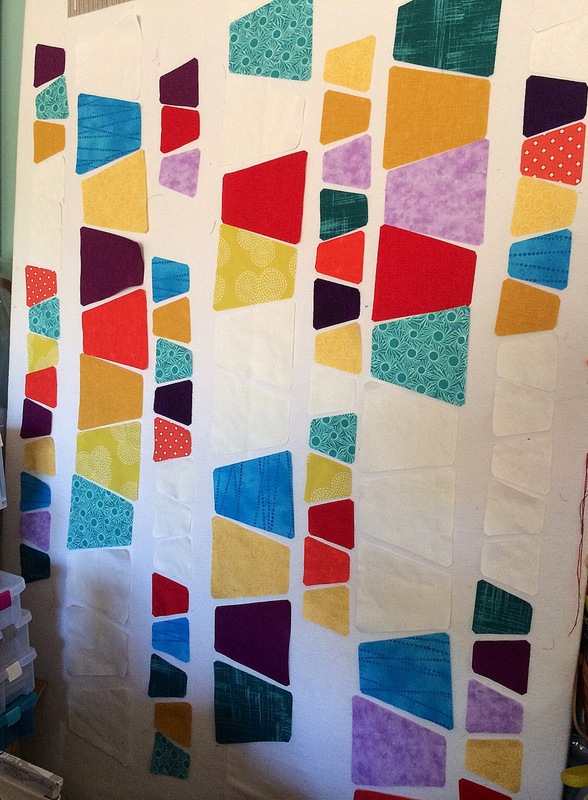 I love the concept of making columns of patches for the quilt top. There are many quilts presented in the book and are all very interesting. I can’t wait to make another! The book also did a great job in presenting traditional patches in a modern interpretation. My quilt top sewed together so nicely since everything was cut with such accuracy. The top finished at 48″ x 56″. 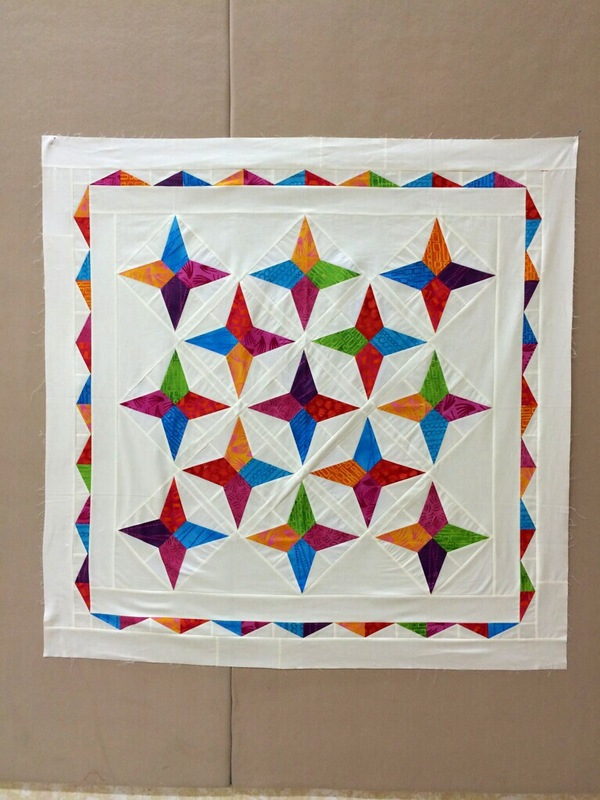 Quilt designed and pieced by Sue Bouchard. 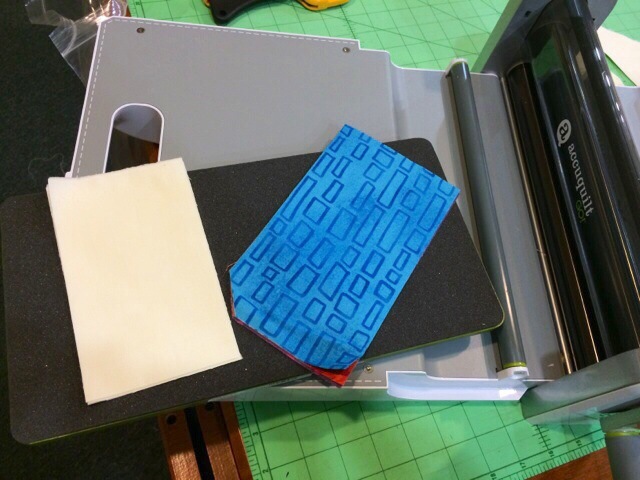 Do you have an AccuQuilt cutter? 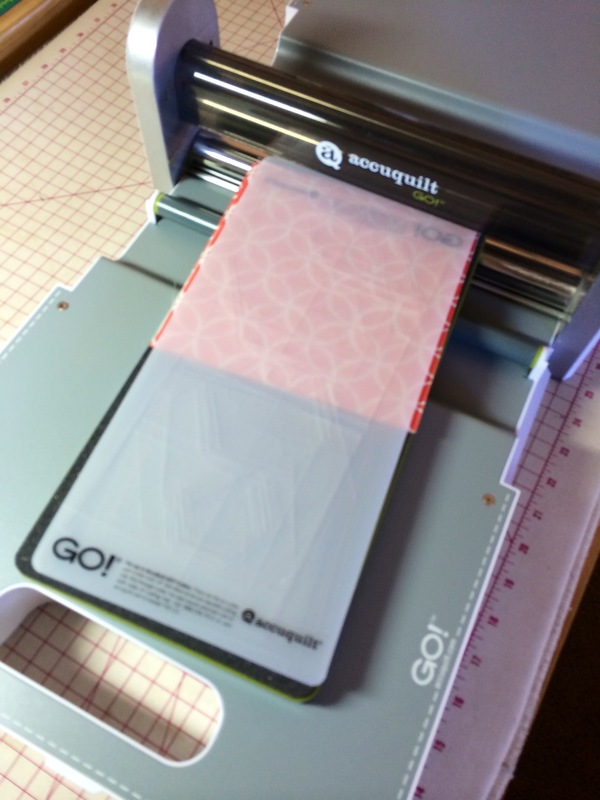 AccuQuilt makes quilting so much easier by “cutting” your cutting time exponentially! 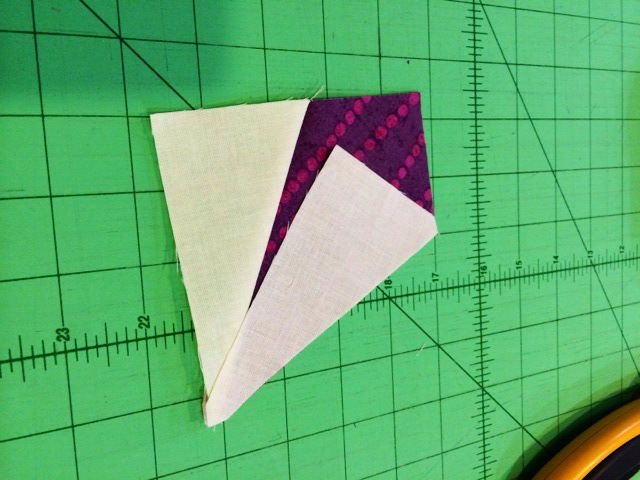 You can cut squares, triangles, and even STRIPS with AccuQuilt! 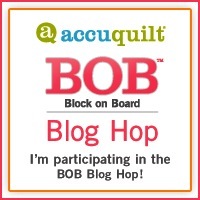 For this Blog Hop, AccuQuilt be promoting BOB (Block on Board) dies! Speed — Cut an entire block in just one pass. Utility — All the shapes needed to create a block on one board. Value — You don’t need to buy multiple dies to cut out a block. 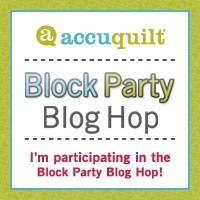 During this Blog Hop, AccuQuilt has made the pattern corresponding to each bloggers blog post free to download at www.accuquilt.com. 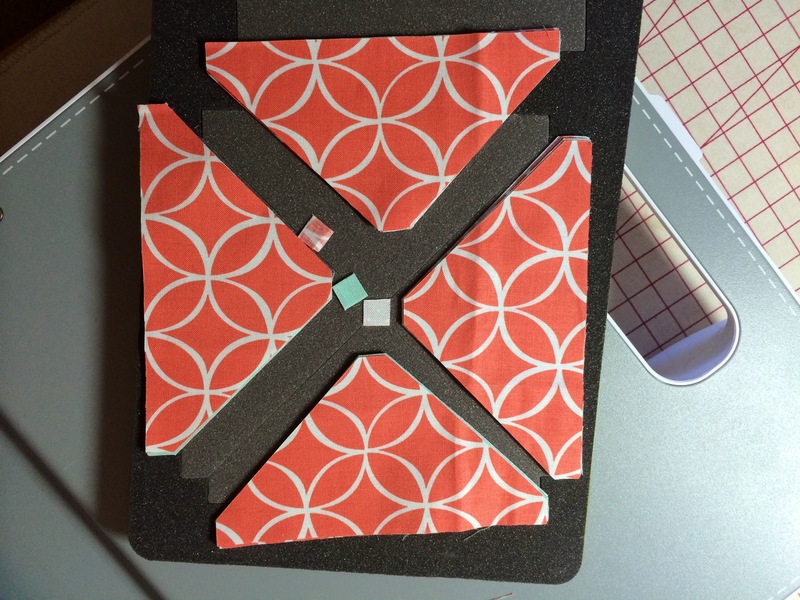 With my busy schedule, Sue took on our project for this blog hop. 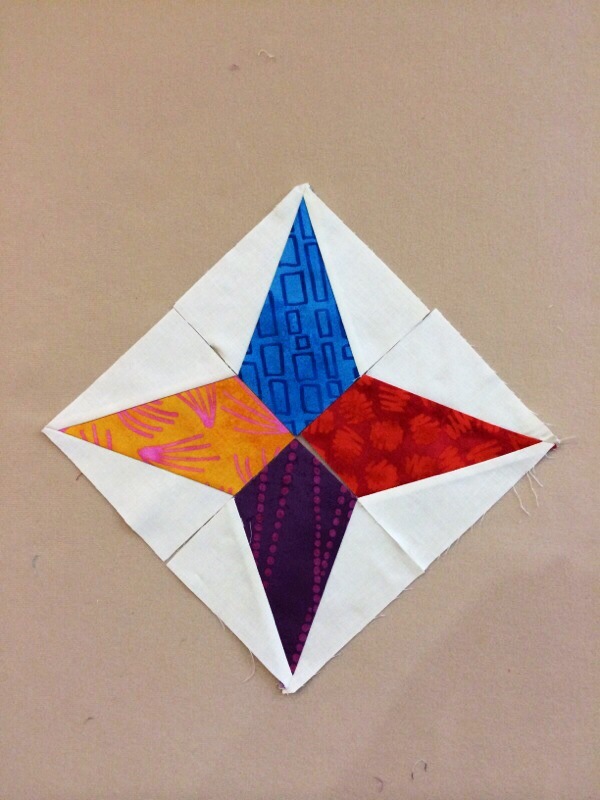 Here is Sue’s fun quilt with the Ohio Star Die, enjoy! I opened my brand new 12″ Ohio star Die (55174) today. 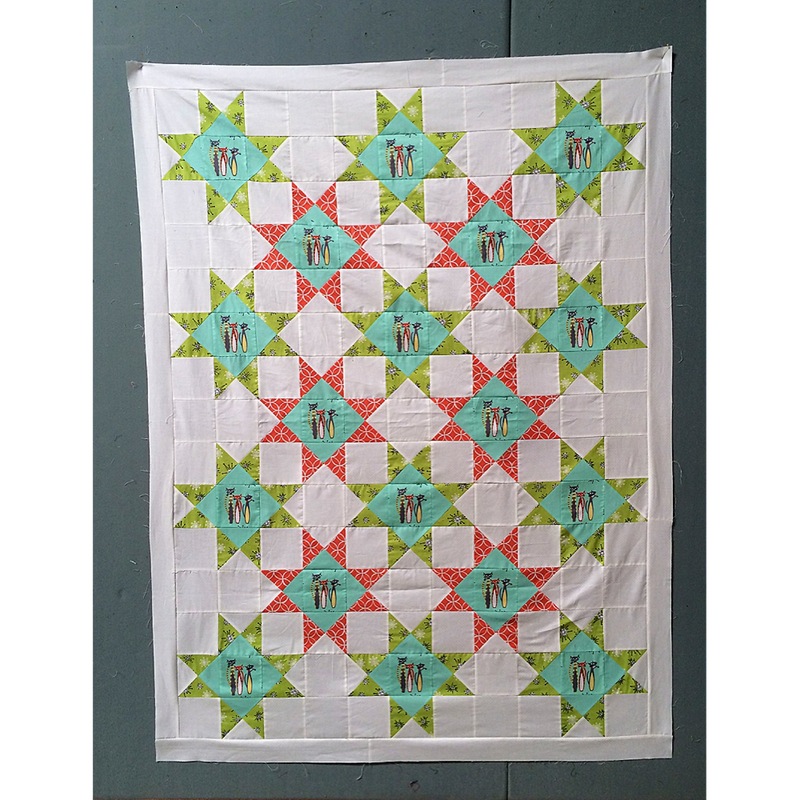 It is great that you can make a whole quilt with only one Die. I am very excited to see how it sews up. 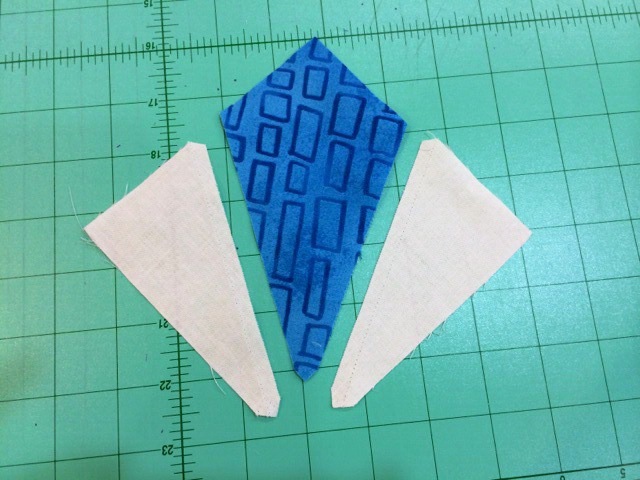 I cut the fabrics a little bit bigger than the outline of the die. 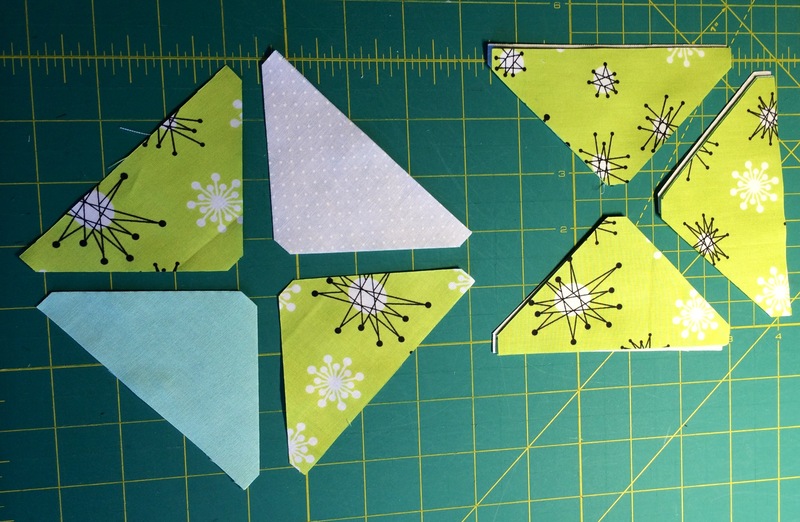 After running them through my Accuquilt GO, I successfully got the exact size I needed. 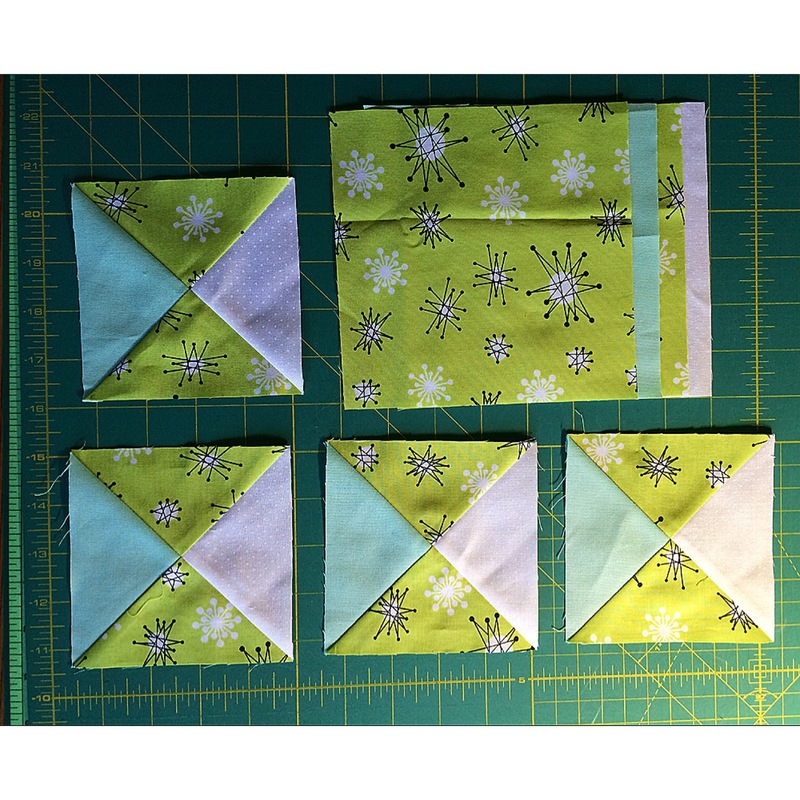 Since I decided to make two different colors of Stars I divided my fabrics so each cut would make one Block. 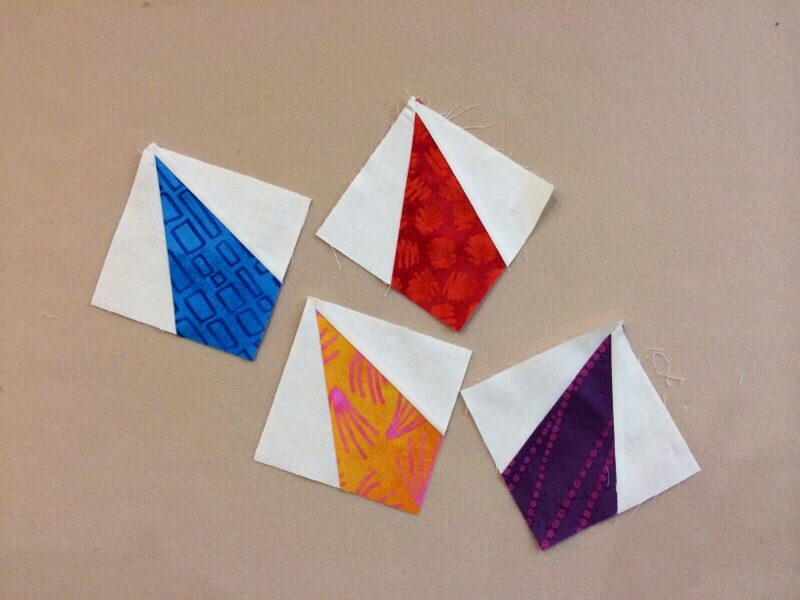 The notches at the ends of the patches are such a great way to position your fabrics for sewing. Love it! 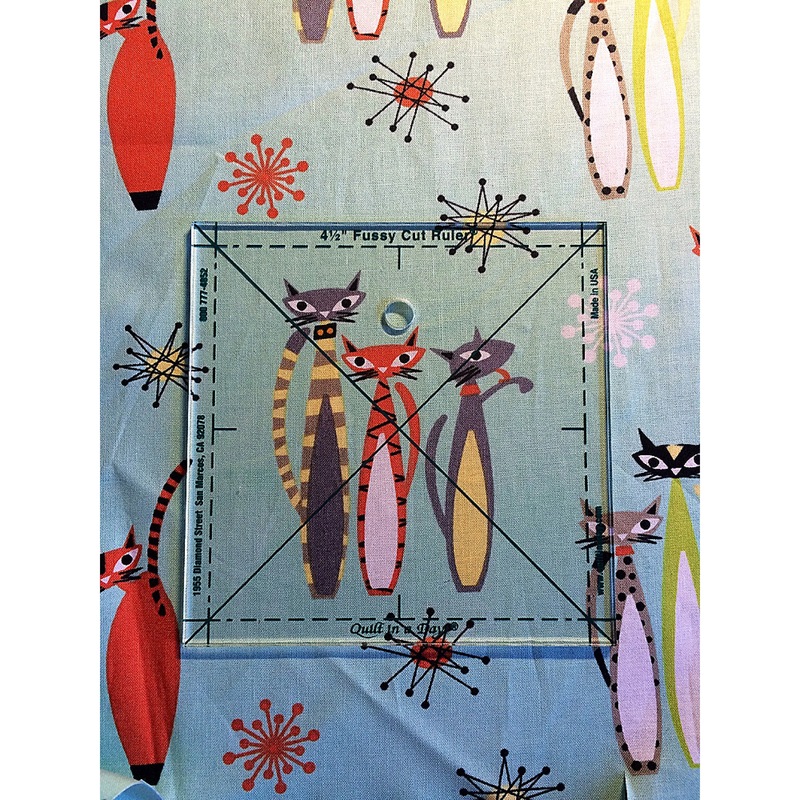 You can use the 4 1/2″ portion of the Die for cutting the center of the block, but I found this really cute Michael Miller fabric called Atomic Cats. I thought the three cats grouped together would be perfect for my centers. 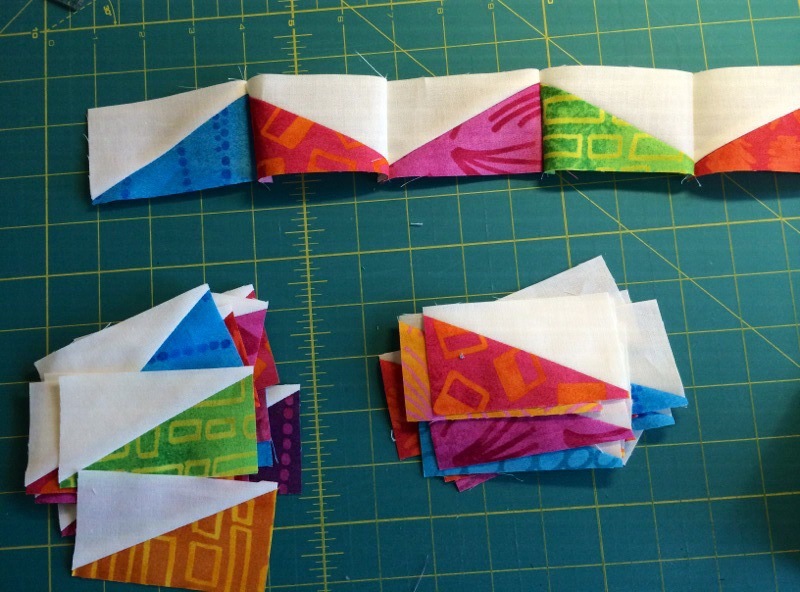 I used Quilt in a Day’s 4 1/2″ Fussy Cut template to cut each one the same. After sewing the Quarter Square patches together and cutting my centers, I used the design wall to figure out how to place my patches. My quilt top sewed together so nicely since everything was cut with such accuracy. The top finished at 48″ x 64″. 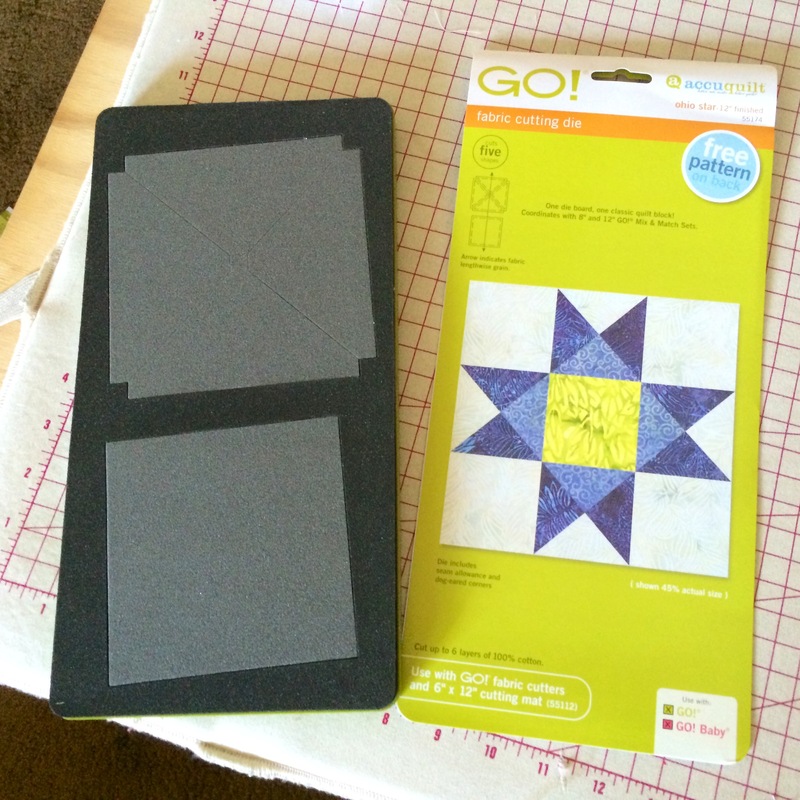 The Accuquilt GO is the best! 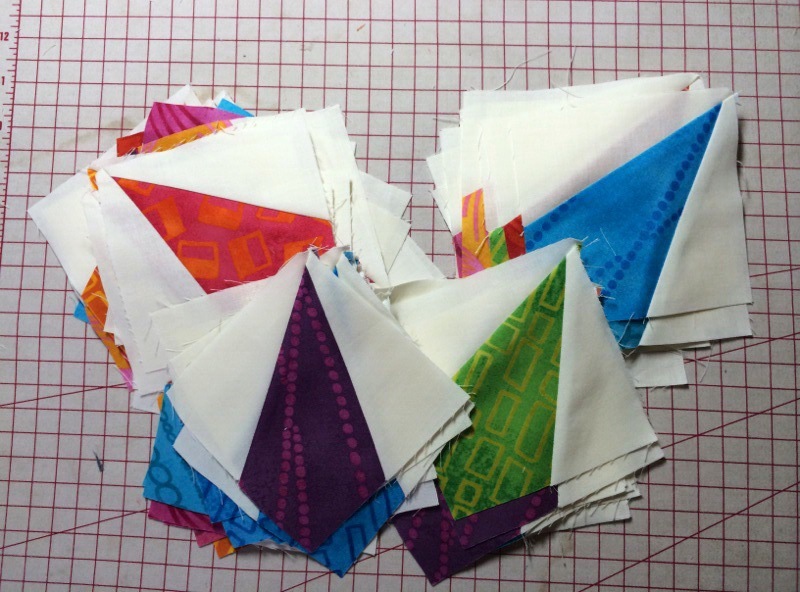 “Hop” on over to the next post and get inspired to cut with AccuQuilt! 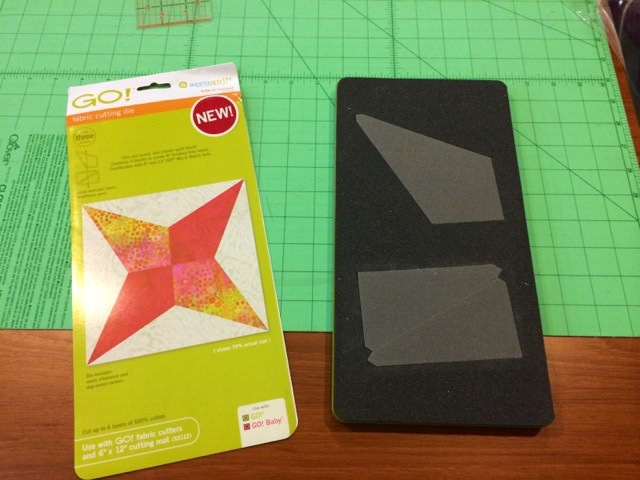 AccuQuilt Blog Hop and New Dies! 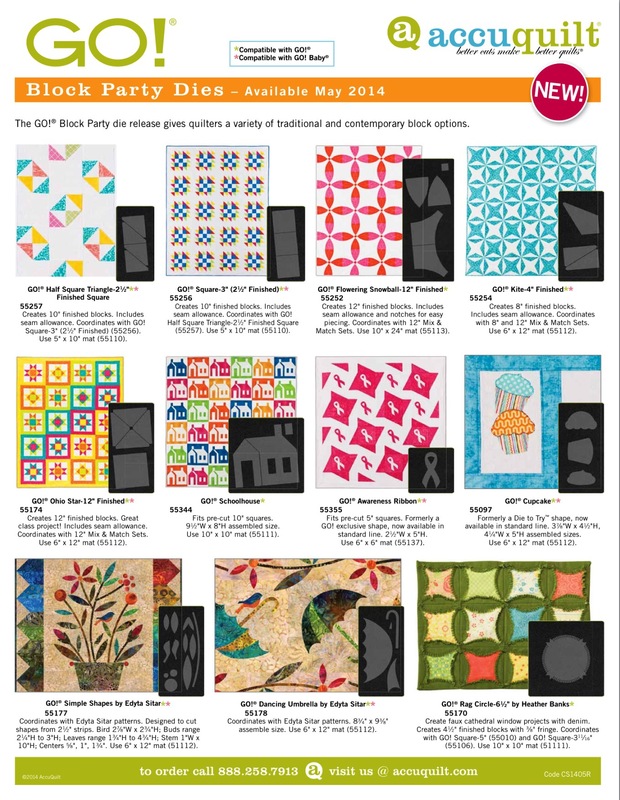 AccuQuilt has 11 New Dies that they are releasing this Spring! 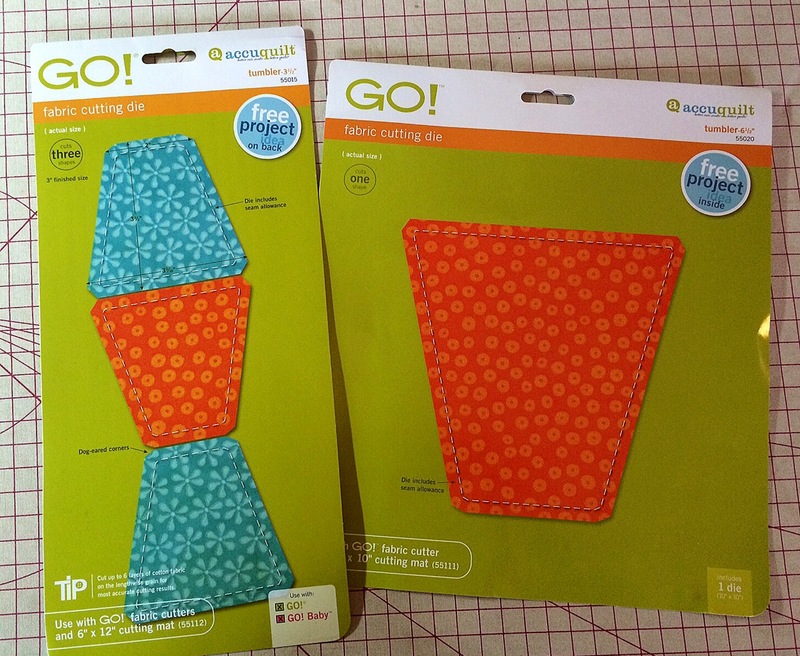 We are participating in their Block Party Blog Hop to premier their new dies! 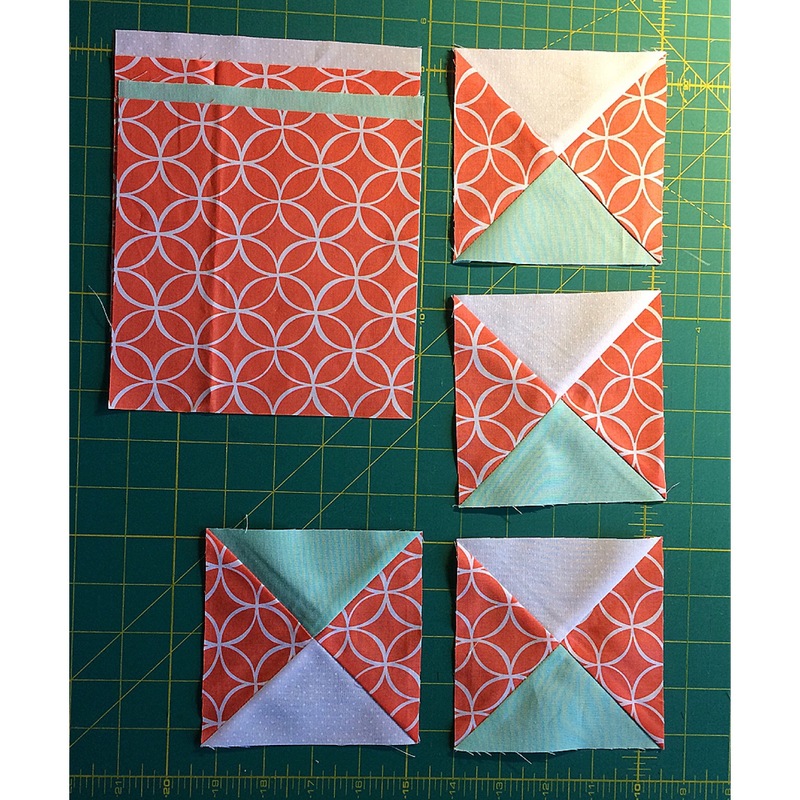 Every day, a blogger will feature one of AccuQuilt’s new dies and give you ideas as to some of the fun projects you can create with AccuQuilt! As you know, it can get a little busy, now with 5 grandchildren AND getting my quilts done. 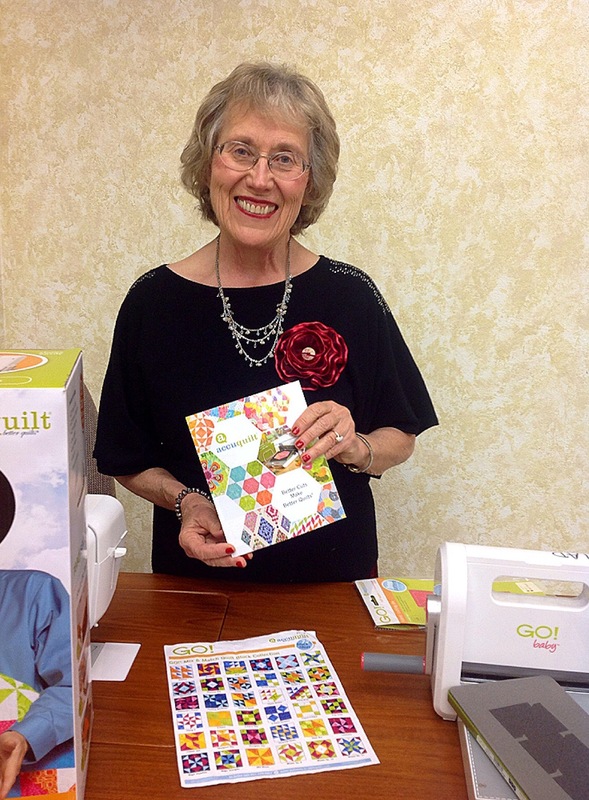 Sue and I have teamed up to make this project using AccuQuilt’s new 4″ finished Kite die. When we received the die, we were very excited to see how it would sew up. 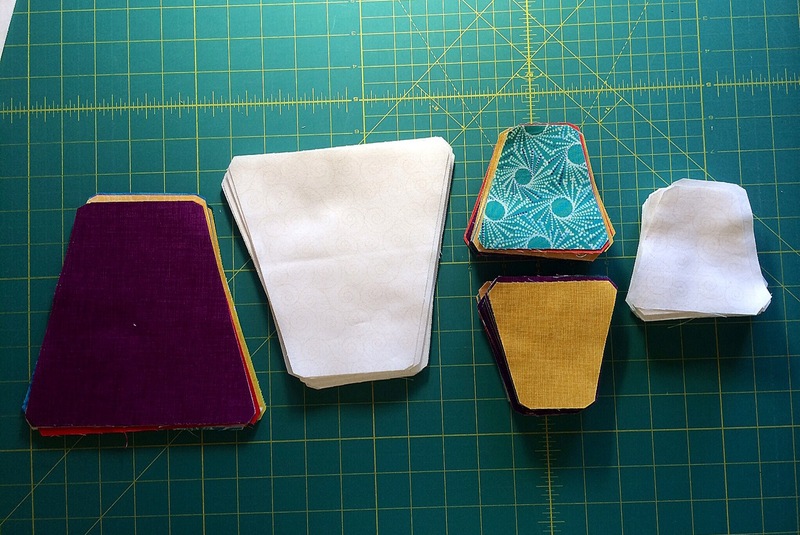 Sue and I cut the fabrics a little bit bigger than the outline of the die. 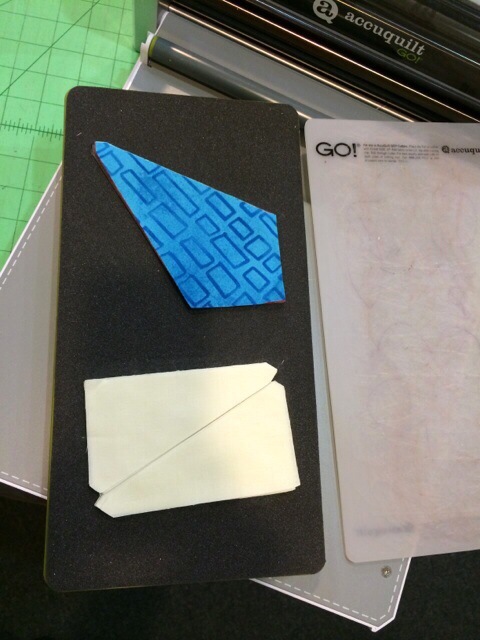 After running them through my AccuQuilt GO, we successfully got the exact size we needed. I laid out the patches so that we could get a visual of how the blocks would look. 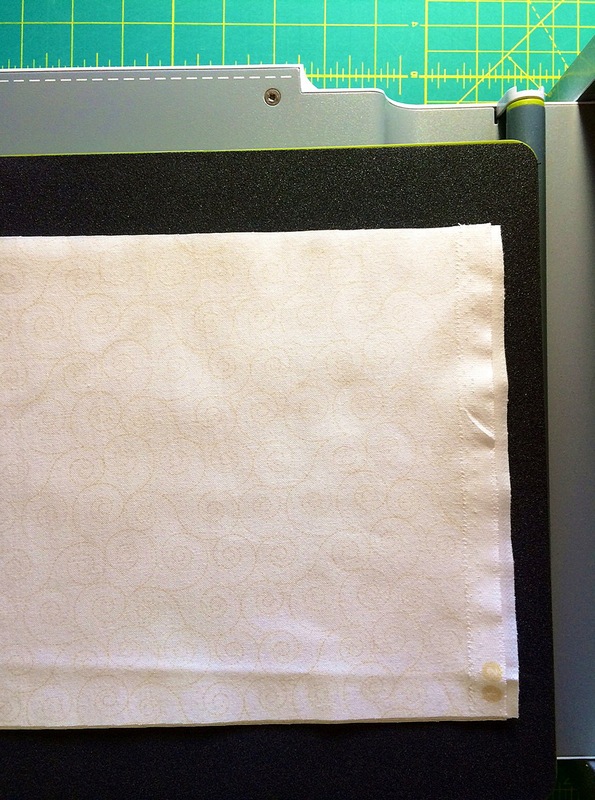 The notches at the ends of the patches are such a great way to position your fabrics for sewing. We love it! After sewing a few patches together, I can use the design wall to figure out what to do with them. I think I will place the patches on point and make the Hummingbird Block. Before I finalize anything though, we will make some more. They go so fast with the Accuquilt! Sue and I will post the progress on this project on our Blog Hop day, the 28th. 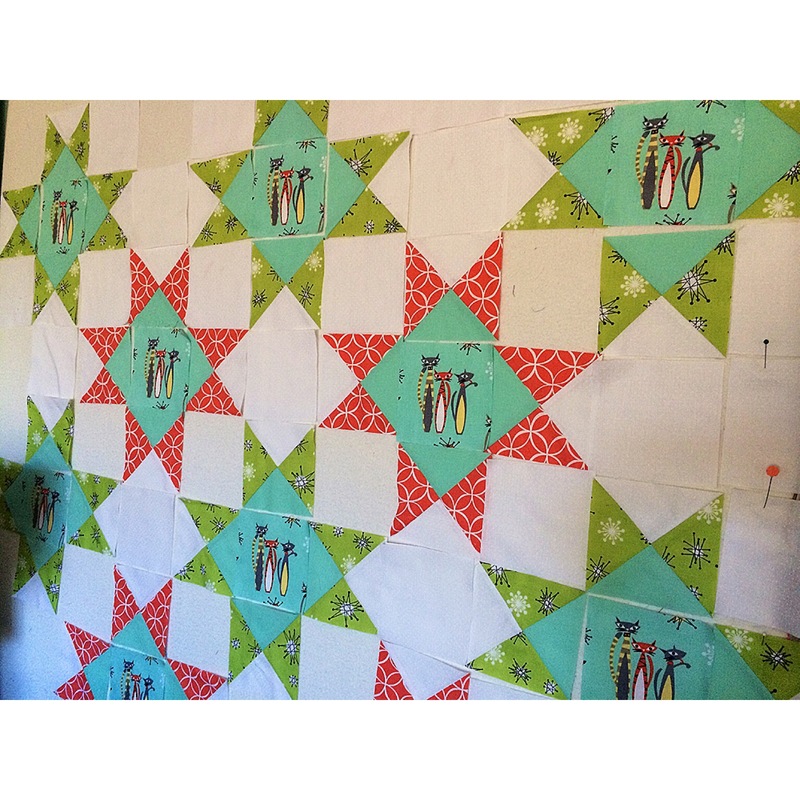 “Hop” on over to the other blogs participating to see what they are up to with their new AccuQuilt Die!